Baton Rouge, LA – March 24, 2016 – Lamar Advertising Company (Lamar) (Nasdaq: LAMR), one of the largest out-of-home advertising companies in North America and RAREFORM, an outdoor gear and lifestyle brand that repurposes billboards into unique bags, have partnered with renowned artist Tyler Ramsey to launch the second installment of Art Lives. Replacing traditional ad space with art, Art Lives is a billboard campaign that brings artwork to the public and then gives the art a second life as repurposed, one-of-a-kind bags and accessories. Lamar Advertising and RAREFORM announced the campaign in October 2015 with artwork from Milton Glaser. 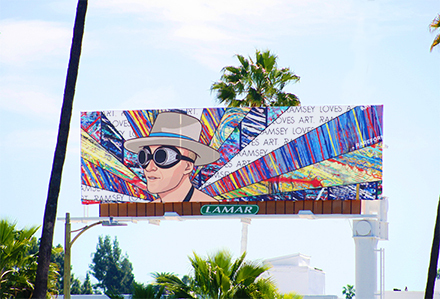 For this installment, Lamar Advertising is displaying Ramsey’s artwork – an original piece designed especially for the campaign – on one of its iconic billboard locations in Los Angeles. 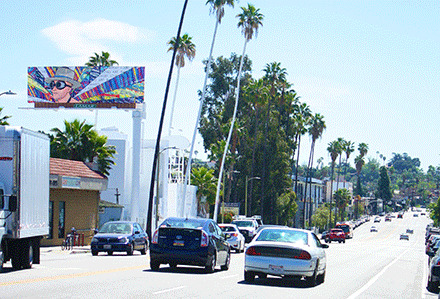 The artwork was installed on Sunset Blvd this week in the heart of Silver Lake, the artist capital of Los Angeles. Photos: Tyler Ramsey’s artwork displayed on a Lamar billboard in Los Angeles. After the public art display, RAREFORM will repurpose the artwork from the billboard, creating limited-edition bags and accessories. Lamar will rotate Ramsey’s artwork from Sunset Boulevard to another location in Downtown Los Angeles next week. The billboard campaign will run in Los Angeles through the end of April, and then RAREFORM will give the artwork a second life as unique bags and accessories. Founded in 1902, Lamar Advertising Company (Nasdaq: LAMR) is one of the largest outdoor advertising companies in North America, with more than 325,000 displays across the United States, Canada and Puerto Rico. Lamar offers advertisers a variety of billboard, interstate logo and transit advertising formats, helping both local businesses and national brands reach broad audiences every day. 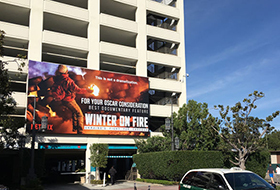 In addition to its more traditional out-of-home inventory, Lamar is proud to offer its customers the largest network of digital billboards in the United States with over 2,400 displays. Please feel free to explore our website www.lamar.com or contact us for additional information. RAREFORM is a sustainable outdoor gear and lifestyle brand committed to creating goods made from re-purposed billboards. Since its inception in 2012, RAREFORM has grown from initially creating just surfboard bags to currently offering a wide array of bags including backpacks, totes, wallets, laptop sleeves, and more. RAREFORM's products are durable and weather-resistant, and each has a one-of-a-kind design. Aside from upcycling billboard materials, RAREFORM is committed to giving back through the environmental campaign 1% For The Planet. For more information, please visit our website www.rareform.com. Tyler Ramsey is a unique artist that attacks the canvas with his entire body. He throws, smashes, and stomps paint onto his canvases. Ramsey started throwing paint at Toms in 2006 and has finished over 100,000 hand-painted shoes. Residing in Los Angeles and having close ties with the greater creative community Tyler is able to affect pop-culture through his paintings attracting Hollywood influencers from celebrities, executives and activists who proudly showcase Tyler’s incredible talents and desire for a greater imprint than simply having art hung on a wall. For more info on Tyler, check out his site www.ramseyart.com. Lamar Advertising Company (Nasdaq: LAMR), a leading owner and operator of outdoor advertising and logo sign displays, announces that its board of directors has declared a quarterly cash dividend of $0.75 per share payable on March 31, 2016 to stockholders of record of Lamar’s Class A common stock and Class B common stock on March 16, 2016.